Well known for its delicious and pungent chili taste, Kung Pao Chicken represents a Szechwan influence with its chili peppers. I addition, this recipe enhances the peanut taste with a bit of creamy peanut butter. Also, a bit of fruity sweetness and a bit of tartness is added from the wine an the wine vinegar used in the marinade and sauce. It is definitely Kung Pao Chicken and you will recognize the taste and you will also appreciate an increased depth of spicy Szechwan inspired flavor. Cut chicken beasts into bite-sized pieces. Set aside. Use whisk or blender to combine all marinade ingredients. Pour marinade into a glass or stainless steel bowl. Add reserved chicken pieces to marinade and stir to coat thoroughly. Cover with plastic wrap and refrigerate for at least 1 hour, stirring twice or more while marinating. Trim green tips and root ends of scallions. Slice diagonally into 1-inch lengths and set aside. Peel carrot. Use peler to make thin shavings of carrot. Trim celery and make thin diagonal slices. Add 1 tablespoon oil to a hot wok. 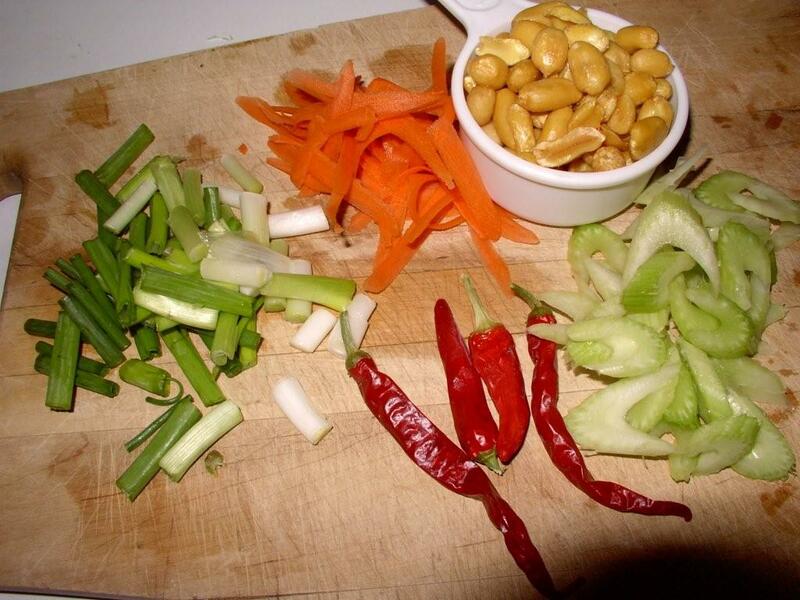 Add celery and peanuts and stir fry until peanuts start to brown. Add carrot shavings and stir. Remove peanut mixture and reserve. Add 1 additional tablespoon of oil to same pan. Drain chicken pieces and reserve marinade. Add chicken to wok and stir fry until chicken starts to brown. Add reserved chile peppers and peanut mixture and continue cooking until chicken is browned. Add scallions and cook 1 aditional minute. Add cornstarch to reserved marinade and mix well. Add to cooking chicken. Cook and stir until sauce thickens to your liking. Remove from hot pan to stop cooking. 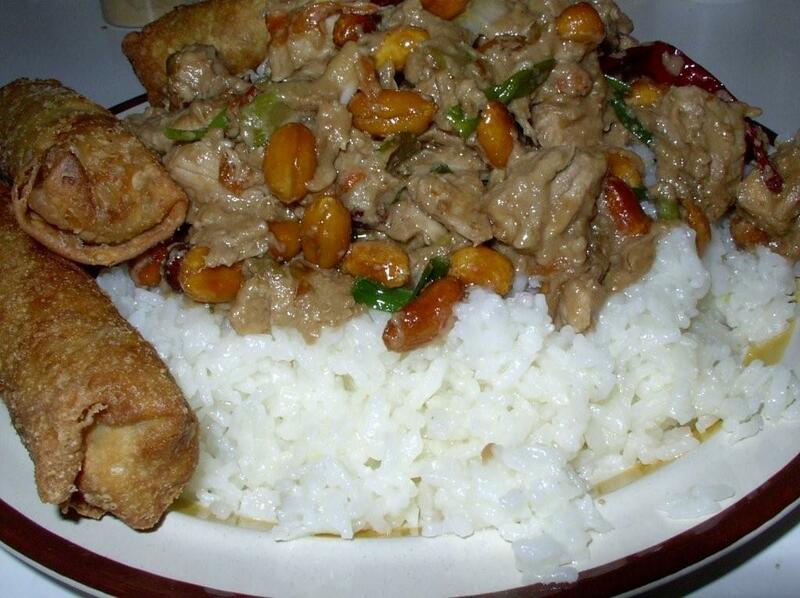 Serve family-style over cooked rice with eggrolls.